Maurice Ravel, Trois Poèmes de Stephane Mallarmé. George Onslow, Nonet in a minor op. 77. Louise Farrenc, Nonet in E flat major op. 38. 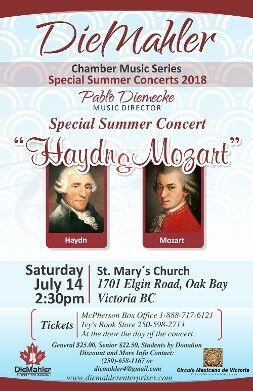 Haydn and Mozart program by the DieMahler Ensemble. 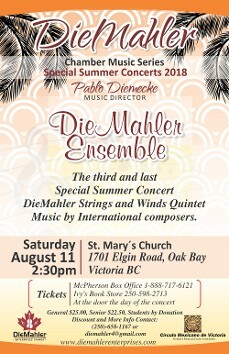 August 11 at 2:30 PM Music by the DieMahler Strings and Winds Quintet. 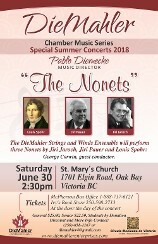 The DieMahler String and Winds, will perform Nonets by Spohr, Pauer and Jaroch. 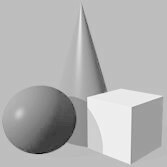 DieMahler Ensemble, Ceci and Pablo Diemecke, flute and violin;; Patricia Kostek, clarinet; Lanny Pollet, flute; Rainer Roth, Oboe; Larry Skaggs cello; Bill Perriam , violin, Kate Rhodes, viola; Frances Perriam, harphsichord will be perfoming Amy Beach’s variations, Elisabeth-Claude de la Guerre’s Sonatas in D Major and G minor, Antonio Vivaldi’s double flute concerto and Franz Krommer’s clarinet concerto and Strings. DESCRIPTION: Like a different sparkling gem in a treasure box, each concert in this beautiful series offers a different flavour of musical colours and textures, with varied repertoire, from virtuoso classical works to gorgeous light romantic works that explore the wide range of musical emotion and expression. The DieMahler Ensemble specializes in masterful musical artistry, vibrancy, character, and very deep feeling, leaving no musical path unexplored. SUBSCRIPTION TICKETS: YOU GET 4 CONCERTS FOR $75.00 OR 5 CONCERTS FOR $90.00. For Subscription Series or tickets discounts call (250) 658-1167 or send us an e-mail.